You'll be £10.00 closer to your next £10.00 credit when you purchase Flanders 1915. What's this? Photographs as featured on War History Online. 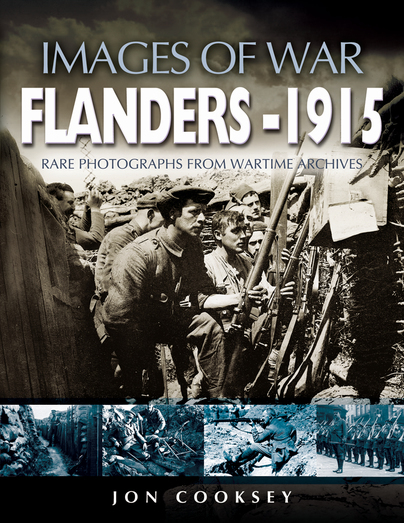 I honestly believe that this really is one book that anyone with the even the slightest interest in the Great War will appreciate, as it is includes one of the best collections of war photographs I have seen in many years. This splendid publication tells the story, through these rare and previously unpublished pictures, of the 1/5th Battalion of the York and Lancashire Regiment (a Territorial Army unit), from the time of its mobilisation in August 1914, through to the battalion seeing action in the trenches of the Ypres Salient . The photographer responsible for this remarkable collection was a junior officer from Sheffield, who whilst serving with the regiment during those early war years, took his camera just about everywhere with him. Thanks to his forethought in those troubled times, his legacy now provides us with a unique record of the brave "weekend soldiers" from South Yorkshire, when they were called upon to "plug the gaps" in the Regular Army, as it was experiencing severe manpower shortages due to the high degree of casualties, following four months of hard fighting. Although this particular volume will be of special interest to family and local history researchers from the South Yorkshire area, I am sure it will also appeal to a wider range of readers too. Battlefield guides, militaria collectors and wargamers, together with students of military and photographic history plus many more, will find it interesting and an excellent source for future reference. honestly believe that this really is one book that anyone with the even the slightest interest in the Great War will appreciate, as it is includes one of the best collections of war photographs I have seen in many years. The photographer responsible for this remarkable collection was a junior officer from Sheffield, who whilst serving with the Regiment during those early war years, took his camera just about everywhere with him. Thanks to his forethought in those troubled times, his legacy now provides us with a unique record of the brave “weekend soldiers” from South Yorkshire, when they were called upon to “plug the gaps” in the Regular Army, as it was experiencing severe manpower shortages due to the high degree of casualties, following four months of hard fighting.